Warren's Wisdom: Warren Ploenges directs his troops at Under-16 level earlier this season. 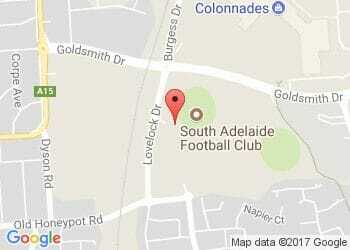 South Adelaide is delighted to announce the appointment of Warren Ploenges to the role of Football Manager. A restructure in administration will see Neill Sharpe relinquish his duties as Football Manager and continue as solely Chief Executive Officer in 2017, while Warren will combine the role of Football Manager with his current role as Talent Coordinator with the Centre of Excellence. Warren, the son of 1964 Premiership star Bryan Ploenges, has enjoyed an extensive involvement with the South Adelaide Football Club that spans over 30 years. "I am very excited by the opportunity to expand my role at South Adelaide to include working with the Club's senior programs," said Mr Ploenges. "I look forward to assisting Garry Hocking, the senior leadership team and senior players to work towards achieving our goals for the 2017 season. "It is also very pleasing to maintain an involvement at the junior level and I am looking forward to continuing to assist TonyBamford in helping our many talented junior players in their transition through the Club's Talent Pathway and into the senior squad and beyond. "On the field, we are in a strong position with an experienced playing group, while there also remains great opportunities for our younger players to step up and make their mark. "Longer term we have some real talent coming through the ranks that will ensure South Adelaide remain a competitive force for a number of years to come." As a player himself, Warren progressed through the Panthers Development Squads and Under-19 programs and played 21 senior games between 1985-88. Along with his involvement as a player, Warren has enjoyed an extensive administrative career with South Adelaide, which includes roles as Technical Development Officer (Talent Manager) during the Panthers move from St Mary's to Noarlunga, three years coaching the Reserves, a Community Football Development role with the SANFL aligned to the South zone for 11 years and most recently as Talent Coordinator assisting Talent Manager Tony Bamford with the Club's Centre of Excellence and as an Assistant Coach with the Under-16s. We congratulate Warren on his new role with the club and we are confident he will help us achieve our goals in the 2017 season.